I love these ah ! Ooo they look like fish scales! Ok, I need to critique the art here: The "scales/laces" whatever you want to call them are too sparsely spread and end up looking like diseased boils. The type of boils that developed during the Black Plague, for example. Perfect for the Plague Flight really, but generally speaking, it still isn't as good as it could be if the "scales/laces" were closer together and all over the body to give a more feathered OR scaley look to the design (which more people could enjoy). At first i was sceptical but then i changed my mind after regening this babe. 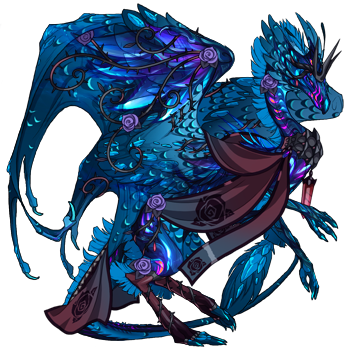 I think on certain dragons with certain color palettes it works. I was excited at first because I thought the gene would put the dark edges on the tips of feathers like in birds. I wanted to make some feathered dergs look like laced foul. My hopes were quickly dashed. So now we have Lace and Laced? Coulda had a bit of a better name. That's going to get confusing.